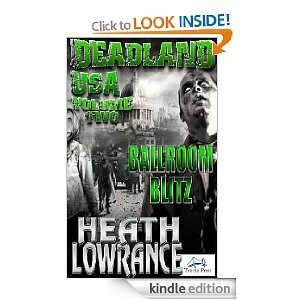 Ballroom Blitz is the second in Heath Lowrance’s ongoing zombie series. We travel back to a time at the beginning of the zombie troubles and learn more about the character, Sammy, who writes the journal from which the narrative is told. The author again impressed me with his wise cracking comments. Heath has the mentality of a cocky late teen down pat and we never doubt for a moment that the narrative is coming from a youth. Alcohol, music and clubbing are the things that are of interest to most late teens and, as it is Sammy’s birthday, it seems fitting that most of the story takes place in a club or ballroom as the author calls it. Here is where things go darker. Zombie genre lovers will enjoy the grisly and descriptive gore that the author uses to bring an extra dimension to the story. As a fan of zombie fiction I enjoyed this second story and am ready to get my teeth into the third tale as fast as the author can release it. Heath Lowrance is a writer of some considerable talent and he brings several elements to the genre that makes it a fresh and thoroughly enjoyable read.